The 2018 season is officially over for the UCF Men’s Basketball team. The Knights, who finished with an overall record of 19-13, were not selected to either of the two major post-season tournaments on Sunday. After falling to Houston (26-7) in the AAC Tournament quarterfinals on Friday 84-56, the Knights had potentially played their last game of the year at the Amway Center. Redshirt senior A.J. Davis was hoping to get another shot at playing in front of UCF fans, but the team’s resume just wasn’t strong enough. Coming into the season, UCF had high hopes of making runs deep into either of the post-season tournaments and in the AAC conference tournament. They had added the “grey squad”, big transfers, and had hopes of Davis, redshirt junior B.J Taylor and junior Tacko Fall leading the team, but several injuries ruined those hopes. Still though, the Knights managed to go 9-9 in conference play and earn a 12-4 record at home. 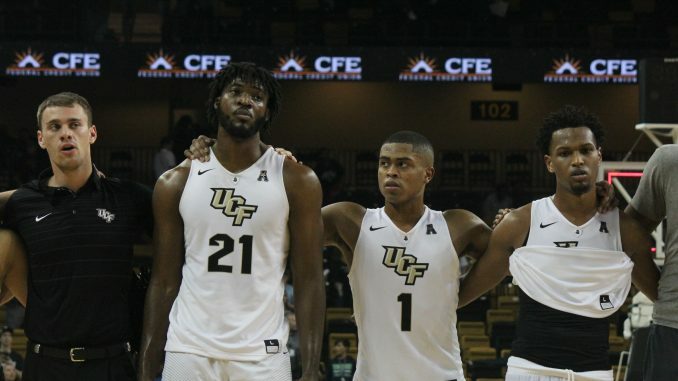 The Knights are hoping next year will be different with several young players maturing into their roles and developing a skill-set UCF can use on the court, while also looking for big performances from next years redshirt seniors Aubrey Dawkins and B.J Taylor. It’s still unclear if Fall will be returning to UCF or if he will try and make it to the NBA.